The tribal revolutionaries in Irian Jaya have been subdued and surrendered, say Indonesian sources. But as SOEHARJONO reports from Jayapura, Jakarta is taking no chances. Stone Age tribesmen appear to have ended their revolt against Indonesian rule in the vast, backward province of Irian Jaya. Thousands of tribesmen came down from the hills in the Baliem Valley high in the interior recently and gave themselves up, severing their connections with the underground Pree Papua Movement (OPM) according to Indonesian officials. But the Indonesian authorities are taking no chances. They have started an intensive indoctrination campaign to make sure that the tribesmen, who make up nearly half of the territory's 750,000 population, remain loyal to Jakarta. The OPM wants to turn Irian Jaya into an independent State separated from the Indonesian Republic. OPM leaders claim that the Irianese people do not belong to Indonesia, which acquired the territory from the Dutch in 1963 after years of bitter wrangling. Several OPM leaders have fled to Papua New Guinea on the eastern half of the island. Indonesian troops are still conducting mopping up operations against OPM agents who are believed to have infiltrated among the Dani tribes. The situation is under control, according to the sources. "The Dani quickly repent once they realise that they have done wrong," one source says. Indonesian authorities at indoctrination sessions tell the tribesmen that they have been misled by the OPM which has "brought death and destruction to their peaceful land." The Dani rebellion reached its climax last April when the tribesmen went on a rampage following a brawl at a soccer match in Baliem Valley. More than 250 tribesmen were killed in military operations launched immediately after the tribal uprising. But violent incidents involving the tribesmen continued in the Central Highlands. The latest was an attack by a group of Dani tribesmen on a local police post recently. One policeman and nine tribesmen were killed in the raid. ''We cannot force them, but we must persuade them of the benefits of change," one official says. "Once we know how to deal with them and they can feel the advantage of what we want, they will accept." Police sources say the OPM has alienated the tribesmen by using force on them to support the separatist cause. They claim rebel remnants in several places have attacked Dani tribesmen who did not support the rebels. But the police add that it is the OPM's tough tactics and serious food shortage in the Central Highlands that are bringing more and more of the tribesmen to surrender. 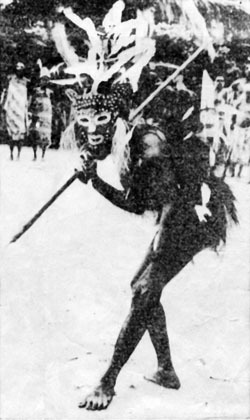 At a recent surrender ceremony in the capital, Jayapura, a Dani chief handed in his spear to the police and proclaimed that his men had turned to the "right path" and would remain loyal to Indonesia. Despite the improved security situation, Indonesia maintains a strong military presence in Irian Jaya. Several new army detachments have arrived in Wamena, the capital of the Baliem Valley, but officials say they are replacements for soldiers who have completed their tour of duty. Indonesian Army units are based in jungles, particularly in the border areas, to prevent crossings by rebels who have taken refuge in Papua New Guinea. Indonesian military authorities say the army must maintain vigilance although the Free Papua Movement has failed in its attempt to stage an uprising with the support of the hills tribes. The Irian military commander (Brig. Gen. Iman Munandar) told me: ''Tribal clashes are common here. The problem is we must watch to make sure that outsiders do not use them (tribesmen) for their political motives."